Some Saints are troubled by this commandment to kill Laban. It is consistent with Christ's later teachings in the Sermon on the Mount, and consistent with God's dealings with mankind elsewhere. Laban's accusation against Nephi's brother that he was a "robber" (1 Nephi 3:13) was a ruse to justify Laban in killing Laman. A person was justified in killing a robber. (Exodus 22:2) Laban was using this as an excuse to justify his intention to kill Laman. Later, Laban commits the very act which he had earlier accused Laman of committing. In this case, as in the case of David (2 Samuel 12:1-7), Laban has made his own judgment upon his own head. Just as David condemned the thief in Nathan's allegory, Laban condemned the robbery which he was about to commit. As certain as Nathan's proclamation to David, "Thou art the man," is Laban's condemnation of the robber, "I will slay thee." Christ's instruction "with what judgment ye judge, ye shall be judged: and with what measure ye mete, it shall be measured to you again," is consistent with the commandment the Lord gives here to kill Laban. It really hit this one out of the ballpark for me. 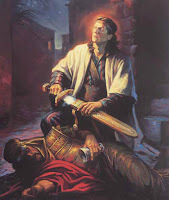 Nephi was not only justified in killing Laban because he was commanded to, but also via the Law of Moses, and of Laban's dishonest application of it (among other possible justifications). Simply beautiful!